Dropping in from my blog siesta (during which I am redesigning this blog so that is why it looks like it is under construction...). Sharing a card and envelope I made with materials sent to me by Jennifer Carter. (I still haven't touched June's kit -- I'm so behind...). Love these bright fun colors and flowers. You can find Jen's blog here. And some of the club's members may be posting as well: Leigh Penner's To the Full. And Melissa Ladd at Melissa's Paperie. Cannot wait to see their creations. Thanks Jen for a great kit. Lots of fun stuff still to be used. >>>>> I am stamping much more since I am not taking the time to photograph and blog. Saving up my creations to begin blogging on a regular basis. Be back in a few weeks! Beautiful, Joan! I love the lined envelope! Very cute card Joan. I like the layout you came up with. What a great kit Jen sent. Glad you are crafting away these days. That envelope and card combo is AMAZING. What great colors...so bright and cheerful, and your layout is, as always, superb. 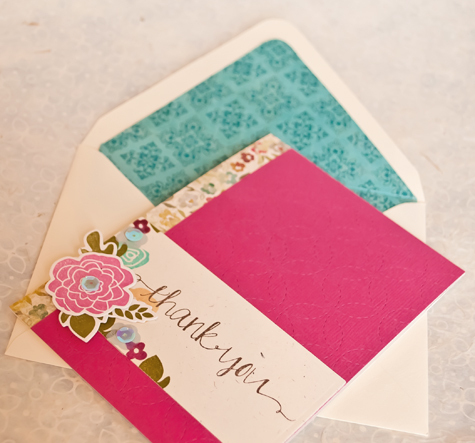 such a pretty card and envelope! Love what you came up with!! And those bright colors! Jen created a great kit for you all to work with! I love your card, that pink is so pretty! Great card! Love it! That little strip of floral paper is perfect. Love your card!! The border on the side is such a beautiful addition to the card! 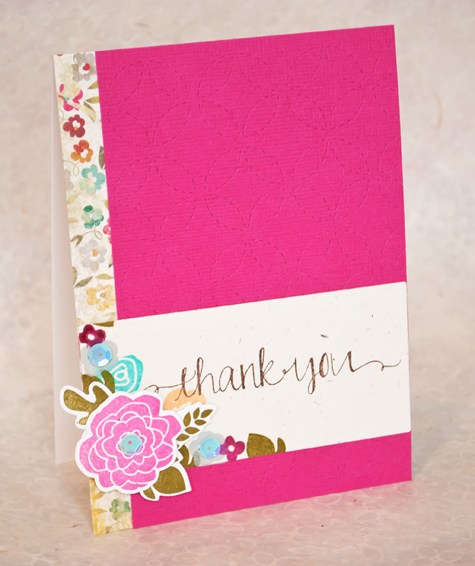 I love how you popped up the die cut flowers on the side panel too! Tonight just got better. Why? Because I stumbled upon your new blog. I had read your other two blogs, though I had never commented, and was so sad when they stopped. I had always hoped you'd be back, eventually. And tonight, just relaxing and looking at cards on some blogs and, wait a minute...Joan B?...could it be?...YES! I'm so happy! I've read all your posts and looked at all your cards. Thank you for coming back. And, look at me, I've finally left a comment. thanks Katy, very sweet of you!